The color of the Striped Burrfish or Spiny Boxfish is a good camouflage in its' natural environment. This one has the spines which are always erect. This is very interesting and intriguing fish! This one is doing what most Striped Burrfish or Spiny Boxfish do very well, looking for food! They will learn that you feed them, and usually swim up to the top every time you approach the aquarium. 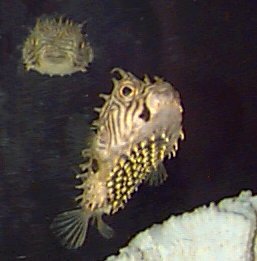 The Striped Burrfish or Spiny Box Puffer, is much less easy to care for than pufferfish. On the positive side, they only reach about 9.8" and are best kept in a fish only tank that is 180 gallons or more. They tend to be reluctant to feed and tend to waste away. Smaller specimens are a little easier to acclimate and feed if other tank mates do not out compete it for food. Deworm them upon arrival to increase their chances. Avoid bottom dwelling fish, slow-moving fish or long finned fish. They will not bother others in it's family and needs lots of swimming space since they are found in seagrass meadows. Provide a 180 gallon tank and feed them meaty marine foods including hard shelled shrimp and hermits to help wear down their teeth. Maintenance difficulty: The Striped Burrfish or Spiny Boxfish is not the hardiest of the diodon family. They may be slow to start eating and like other puffers, they require special care and a special diet to stay healthy. Maintenance: Puffers have strong teeth that grow throughout their lives. They need to be offered hard shelled live food often to keep their teeth worn down. For a better explanation and links to the practice of puffer dentistry (if needed) please read here. Because they eat a meaty diet and are often messy eaters, puffers will produce a large bio load on the biological filter of your aquarium requiring frequent water changes and good maintenance practices. Habitat: Natural geographic location: Striped Burrfish or Spiny Boxfish are found in the tropical Atlantic Ocean and the Caribbean. Foods: Puffers are primarily predatory fish in the wild, though they do graze on algae as well. Acceptable foods include shellfish, crustaceans and hard shelled foods such as snails. A large variety of all kinds of live and frozen meaty foods are best. It is best to feed small amounts several times a day. Some of the suggested frozen foods include prawn, crabs/crabs legs, bloodworms (live or frozen), blackworms (live or frozen), silversides, and mussels. Be sure to wash these foods thoroughly before feeding. Live foods can include snails, crabs, crayfish, shrimp (these are good for keeping their teeth trimmed), and earthworms. Live fish will also be eaten but it is thought it may cause problems such as 'fatty" liver and so should be fed sparingly or not at all.. Puffers are not picky eaters and will quickly become adapted to a variety of prepared aquarium foods and an occasional algae wafer. Flake food is not recommended. Even though they may eat it, puffers will not thrive on it. Social Behaviors: Generally this fish is aggressive among themselves, also, smaller fish may be eaten. Length/Diameter of fish: Striped Burrfish or Spiny Boxfish adults can grow to 30.0 cm (12 inches). Minimum Tank Length/Size: A minimum 60 gallon aquarium is recommended. Water Region: Top, Middle, Bottom No special requirements. My fish has developed a bacterial infection after 2 years of perfect health. I had introduced another fish to the tank and he must have had the bacteria. I treated with Metafix and the Burrfish seems to be getting better. Anyone have any experience with this situation? I was recently snorkling just off the coast of Destin Beach Florida and caught a baby spiny box fish. Might not have been the ethical thing to do, but I netted him and have returned him home to my marine aquarium, where he is housed with a similar sized porcupine puffer, 3 blue damsels and many snails, hermits and other small crabs. He seems more interested in the live seaweed and alagae at this point and I'm concerned about acclimating him to a proper diet. Any suggestions? My husband just caught a baby one in Trout River here on the northside of Jacksonville, FL. He brought it home to me and I have it in a 35 gallon for now. Will have to look for a bigger tank as soon as possible. Doing great. This Spiny Boxfish was caught in a cast net in Brackish water. While walking on a bay beach at night, I stepped on a dead one that had washed ashore in Harvey Cedars, NJ. I practically jumped out of my skin, it hurt so much - fortunately no serious injury. My family and I are longtime fisherman in the area and had never seen one before - but it was in perfect condition and was easily identifiable thru pictures on the internet. I buried it in our backyard. We just bought one...great little fish. He swims to the top of the tank every time he sees me and takes the krill from my fingers! He does puff up occasionally, for no apparent reason. This seems to take a lot of his energy, and he usually rests motionless in this state.